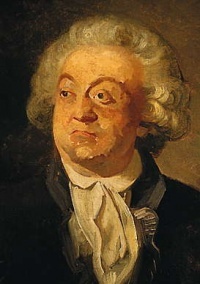 In May 1777, Comte de Mirabeau, 18th century French aristocrat was imprisoned at Vincennes. There he met Marquis de Sade, both of them imprisoned by lettre de cachet, both libertines; however the two disliked each other intensely. They both wrote prolifically in prison, both suffered from graphomania, Mirabeau would write love letters Sophie, Le libertin de qualité and the Erotika Biblion; Sade was incarcerated in various prisons and insane asylums for about 32 years (out of a total of 74) of his life; much of his writing, starting with his debut Dialogue Between a Priest and a Dying Man was done during his imprisonment. For most of history, imprisoning has not been a punishment in itself, but rather a way to confine criminals until corporal or capital punishment was administered. There were prisons used for detention in Jerusalem in Old Testament times. Dungeons were used to hold prisoners; those who were not killed or left to die there often became galley slaves or faced penal transportations. In other cases debtors were often thrown into debtor's prisons, until they paid their jailers enough money in exchange for a limited degree of freedom. Only in the 19th century, beginning in Britain, did prisons as we know them today become commonplace. The modern prisons system was born in London, as a result of the views of Jeremy Bentham. The notion of prisoners being incarcerated as part of their punishment and not simply as a holding state until trial or hanging, was at the time revolutionary. Britain practiced penal transportation of convicted criminals to penal colony in the British colonies in the Americas, from the 1610s through the American Revolution in the 1770s and to penal colonies in Australia between 1788 and 1868. France sent criminals to tropical penal colonies including Louisiana in the early eighteenth century. Penal colonies in French Guiana operated until 1951 (in particular, infamous Île du Diable (Devil's Island)). Katorga prisons were established in the 17th century in Tsardom of Russia in underpopulated areas of Siberia and the Russian Far East that had few towns or food sources. Since these times, Siberia gained its fearful connotation of punishment. The first "modern" prisons of the early 19th Century were sometimes known by the term "penitentiary" (a term still used by some prisons in the USA today or the Dutch "Penitentiare Inrichting/Institution): as the name suggests, the goal of these facilities was that of penance by the prisoners, through a regimen of strict disciplines, silent reflections and perhaps forced and deliberately pointless labor on treadwheels and the like. This "Auburn system" of prisoner management was often reinforced by elaborate prison architectures, such as the separate system and the panopticon. It was not until the late 19th Century that rehabilitation through education and skilled labor became the standard goal of prisons. Unless indicated otherwise, the text in this article is either based on Wikipedia article "Prison" or another language Wikipedia page thereof used under the terms of the GNU Free Documentation License; or on original research by Jahsonic and friends. See Art and Popular Culture's copyright notice. This page was last modified 08:54, 23 March 2019.